A Jackson woman is looking for answers after her dog was badly burned. 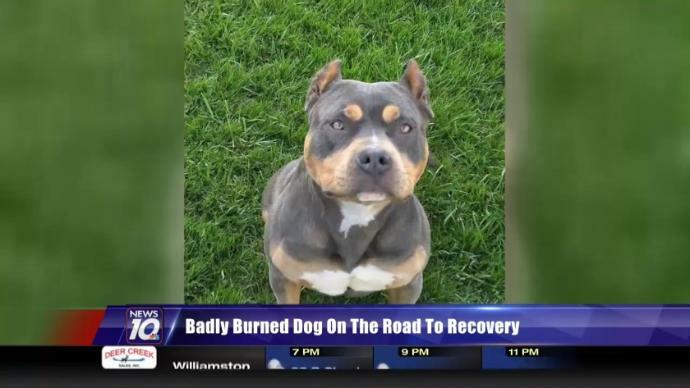 Aubrii, Karma’s owner, found her dog with serious burns on her body after she had gotten out of the yard. She says Karma smelled like fire, and she immediately took her to the vet. It could take two to three months for Karma to heal. Doctor Cathy Anderson of the Jackson County Animal Shelter believes this was animal abuse. Karma is a young pitbull. Aubrii says she’s incredibly friendly, and Anderson agrees. Neither have any idea why someone would’ve intentionally hurt Karma. Fortunately, she’s doing better now. She’s still eating, drinking, and she’s on some pain medications. The wounds, however, are significant. It will still be months before karma will be back in normal shape, but Anderson believes she’s a resilient, loving dog who will be able to get back to her old ways soon. If you know anything about this case, you’re asked to call jackson police. You can help abused animals, like Karma, by donating to the Barkley and Lulu Foundation.